comes to keeping your baby’s skin healthy. following reviews and buyer’s guide. Traditional baby oil is made up of nothing but mineral oil, but there are a lot of different kinds of baby oil that you can choose from. Coconut oil, calendula oil and others do wonderful things for your baby’s skin and yours too if you choose. The following top rated baby oil products are customer favorites due to the quality they have and the benefits they provide. Many people think that baby oil clogs pores but if it is used properly, it can be one of the best ingredients you can use on your baby’s delicate skin. Burt’s Bees is a well known name in health and beauty products and their baby product line carries their dedication to quality just like all their other terrific products. The 100% natural Baby Bee Natural Nourishing Baby Oil soothes and softens your baby’s skin without leaving a heavy greasy residue. It has a wonderful scent of apricots and contains plenty of nutrients and antioxidants that come from apricot and grape seeds. Baby Bee 100% Natural Nourishing Baby Oil is free of synthetic fragrances. The natural ingredients are all you need for your baby to smell fresh and sweet. You can add this baby oil to their bath or apply it directly to their damp skin after bath time to enhance the moisture of your baby’s skin. Burt’s Bees Baby Bee Baby Oil has been pediatrician tested for added peace of mind. It has no phthalates, petrolatum or parabens. This is for a three pack of baby oil so you can get started taking the best care you can of your baby’s skin. You get three 4 ounce bottles of this nurturing baby oil. 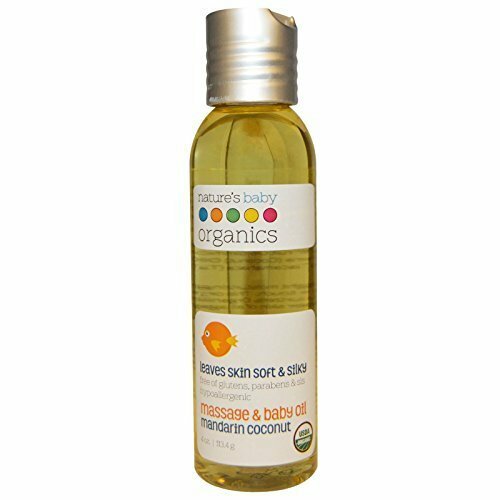 Nature’s Baby Organics Mandarin Coconut Baby Oil is a great product to use for your baby’s skin that will absorb quickly and leave their skin smooth and soft. No worries about leaving a heavy greasy feeling when you are using this product properly. Just add it to their nightly bath time by putting it directly into the bath water, or apply it to their damp skin after their bath is over. The skin soothing properties will eliminate any drying, flaking, peeling and inflammation that the skin is experiencing. It is perfect for your baby and you can use it too. This product is USDA Certified Organic and is Vegan as well as hypoallergenic. The benefits of this light oil will please every parent who wants to only use healthy, beneficial ingredients on their baby’s skin. US Organic provides you with natural and organic baby oil that your baby will benefit from every time you use it. This baby oil with Calendula is made from all natural ingredients that will keep your baby’s skin sift and healthy without the heavy greasy feel that some baby oils can cause. 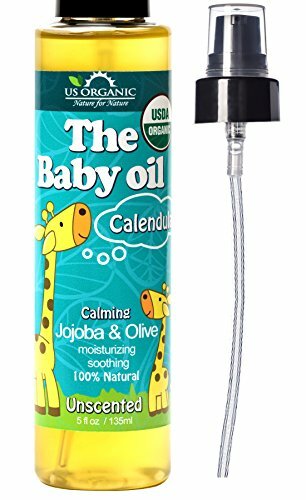 This Certified Organic baby oil is great for baby massage and is better at moisturizing your baby’s skin than any conventional or even natural lotion will. There are no synthetic additives, no artificial colors, parabens, preservatives, scents, artificial colors or artificial detergents in this light and easily absorbable baby oil. Just add it to your baby’s bath or apply it to their damp skin after the bath is over to give their skin protection from drying and flaking. Another thing that parents love about US Organics baby oil with Calendula is that is made in the USA and is part of the Leaping Bunny Program which means it is a cruelty free product and never tested on animals. Calendula is responsible for helping to soothe and calm the skin so if there is any inflammation, this product will help repair and fix it. Because this is all natural oil, you may notice that it becomes cloudy and turn solid as the temperature drops. There’s not anything wrong with the oil and when its temperature is raised it will liquefy again. US Organic offers a “Love it or Money Back Guarantee” so you can really try it risk free. It is the perfect baby product to add to your baby’s bath time routine. Baby oil is a common product that has many uses that can benefit the skin. These top rated choices are all designed for use on your baby and are made with organic ingredients that benefit and nurture the skin. With ingredients such as Organic Sunflower Oil, Organic Olive Oil and others, your baby’s skin will be healthy, soft and smooth. In our buyer’s guide below, we’ll give you more information on how to use these top rated products or others if these are not what you were looking for. Baby oil has a lot of uses for your baby and we’ll tell you what those are and how to best use these great products to benefit and nurture your baby’s skin. Baby oil is a very long standing and well known product used to help moisturize your baby’s skin. There are many benefits that your baby will get when you use it on a regular basis to prevent the common drying, flaking and peeling that your baby’s skin can go through when they are first born. It’s easy to use and many of the products on the market are created specifically for babies and use all natural, organic ingredients that create a barrier against moisture loss and can even correct many skin conditions such as cradle cap, drying, eczema and more. Mineral Oil – Obtained from petroleum, has no odor or color. This oil is typically okay for the skin but is chemically similar to paraffin wax. Vitamin A – Uses the retinol form of vitamin A. This ingredient is often found in skin cream and is used to treat common skin problems and chapped lips. Too much Vitamin A can cause drying of the skin. Honey – Some baby oils may have processed honey in them. This is not harmful to the baby because they are not ingesting it. Honey should never be given to a baby under 1 year of age internally, due to the risk of infant botulism. The purpose of honey in the baby oil is mostly used for the antiseptic properties it has. Carrier oil – this can be coconut oil, jojoba oil, or olive oil and sometimes sweet almond oil. This is the foundation oil that the other ingredients are added to. Essential oils – ingredients like lavender, tangerine and calendula are often added to organic, all natural baby oil. Wheat germ oil – this is the most commonly chosen oil to replace vitamin E oil. Others are sometimes used, but wheat germ oil is the most common. The proper proportions of the above oils are used to create oil that is the right consistency. The proportions do not exceed the concentration levels that would be a problem for your baby. Many parents don’t want to use mineral oil on their baby’s skin so this organic, all natural oil is a preferable choice that they are much happier with. One of the most popular forms of organic baby oil is coconut oil. It is often added to regular organic baby oil but is also used as a standalone product as well. It has numerous health properties that will benefit your baby’s skin in many ways. This all natural healing oil is easy to find. Out of all the natural oils, coconut oil is the best and most nourishing of all the organic oils. It is easily absorbed into the skin and can restore damaged or diseased skin as well. Coconut baby oil has many lasting benefits, and is much more effective than lotions and creams that are created to heal damaged skin. There is no danger is using coconut baby oil on your baby’s skin. It has many antioxidant, anti-bacterial and anti-inflammatory properties that make it the best oil you can use on your baby. The only must is that you use organic coconut oil. There are several different types of organic coconut oil that can be used on your baby. Coconut oil is almost always added to every kind of organic baby oil. There are five main varieties of coconut oil. Pure coconut oil – this is obtained from the dried flesh of coconuts. Nothing is added to this oil so it is considered pure. The meat of the coconut is crushed and milled and the oil is extracted from that. Refined coconut oil – refined coconut oil is not the type that many parents want to use on their babies due to the chemical process it goes through during the creation process. It is refined, bleached and deodorized to become odorless and colorless. The processes required to achieve this result are both chemical and mechanical in nature. This is not a pure form of coconut oil. Virgin Coconut Oil – Virgin coconut oil comes from the coconut milk rather than coconut meat itself. No heating is done during the extraction process so all of the antioxidants are retained. Virgin coconut oil has a pleasant smell and taste to it. Organic Coconut Oil – Extracted from the coconut palms that have only been raised with natural manure and not any chemical fertilizers. No chemicals are used in the extraction process either. Organic Virgin Coconut Oil – Another form of coconut oil that has no chemicals used in the extraction or processing process. This oil is extracted from organically raised coconuts. There are many things that you can use baby oil for when it comes to your baby or child. Below we have listed several things you can do with it. If you are looking for truly chemical free baby oil, be sure to look for oil that has organic ingredients only and that has not been refined. Again, coconut based baby oil is probably the most popular and best choice for your baby. Allergies or Hay Fever – Rub a tiny amount on the inside of the baby’s nostril for quick relief of allergy symptoms and hay fever. The pollen will cling to the oil. Baby Acne Treatment – If your baby suffers from baby acne, a common condition in the early weeks, apply a super thin layer onto the areas that are affected with acne. Make sure to use a VERY thin layer and apply it twice a day. Pure coconut oil would be excellent for this. Bruises – Sometimes babies or toddlers bump their heads or knees and get bruises. Apply the oil directly to the bruise and the properties in the oil will enhance the healing process as well as reduce swelling and redness. Cradle Cap – This very common and alarming looking condition can be remedied by using coconut baby oil. Rub 1 teaspoon on the scalp every day and cradle cap will disappear. Burns – if you apply coconut based baby oil to the burn site right away and continue to apply it while it is healing, it reduces the chances of permanent scarring. Bug Bites and Insect Stings – apply organic baby oil to the bug bite or sting. It will stop the itching and burning and will speed up the healing process. Diaper Rash Ointment – Coconut based organic baby oil provides a lot of soothing comfort for babies with a rash without having to worry about harsh chemicals hurting or making the rash burn during treatment. It is also safe to use with babies that wear cloth diapers. Makes messy diaper clean up a breeze – Here is a cool trick… sometimes cleaning a messy diaper is really difficult. When you put your baby’s clean diaper on each time, get into the habit of putting organic oil on the baby’s bottom and when it comes time to clean a dirty diaper, clean up will be super simple. The mess will just slide right off due to the barrier formed by the baby oil. This trick is great for getting meconium cleaned off of the baby. Strengthen the Soft Spot – Rub coconut baby oil on your baby’s soft spot to fortify the area and strengthen it. This does not mean that care does not need to be taken when handling the baby, but it does provide extra nutrients to the area. Ear Aches – If your baby, toddler or child is suffering from ear aches, take a few drops of organic coconut based baby oil inside the ear two times per day. It will fight the infection and provide some pain relief as well. Croup – There are moms all over the world that swear by a remedy of coconut baby oil and essential oils mixed together and rubbed on the baby or child’s chest that is suffering from croup. Relieves Teething Pain – rub a small amount of coconut baby oil on your baby’s gums to ease the pain of teething. Baby oil doesn’t have to be thick, greasy and full of unnatural ingredients. The top rated choices here are all natural, organic choices with coconut oil foundations that are proven to be good for your baby’s skin. No parents want to use products on their baby that will cause skin irritation, break outs or rashes which is what makes these top rated baby oil choices so popular. They will help your baby’s skin be healthy, smooth and hydrated without the heavy, greasy build up. Once you start using baby oil regularly on your baby, you just may end up using it on yourself too.